Navigant made its first appearance in the Economics 20 last year as a consultancy of 46 economists who spent some or all of their time on competition matters, and it is back this year. But after Ankura Consulting purchased Navigant’s disputes, forensics and legal technology segment – which handles antitrust issues – for close to $470 million, it is under a new, much larger roof. (The tie-up of economics consultancies was given an early termination of Hart-Scott-Rodino review in July 2018.) Who’s Who Legal: Competition recognises four Ankura economists: Debra J Aron, David Eisenstadt, James Langenfeld and Frederick Warren-Boulton. 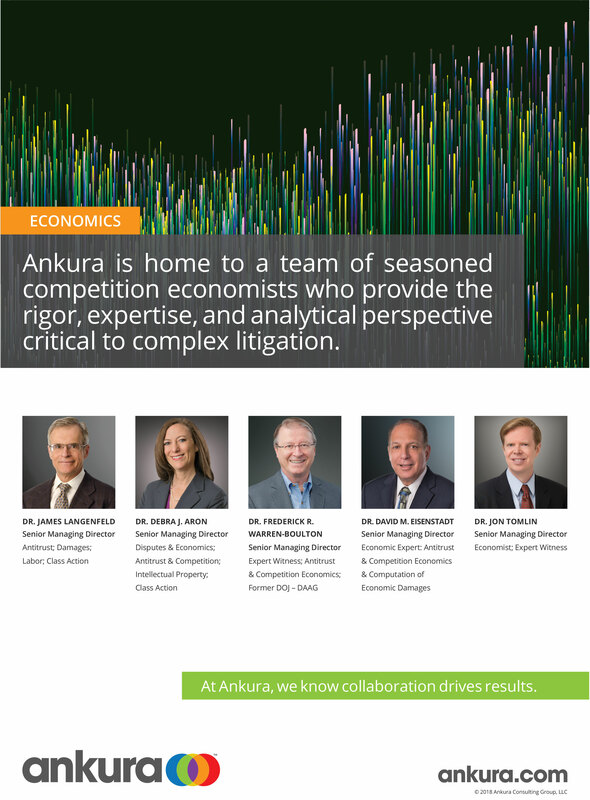 Ankura was busy with competition matters, honing in on 26 cases this year. It is advising the Louisiana Real Estate Appraisers Board against an ongoing FTC lawsuit, in which the agency accuses the state regulator of trying to set minimum prices, and the board defends itself as complying with the federal Dodd-Frank law on property appraisal. The consultancy also advises direct purchaser plaintiffs in separate automotive parts antitrust litigation involving bearings and harnesses. The firm also advised Huawei Devices USA in defence of allegations of theft of trade secrets brought by T-Mobile. The team consults for Steward Health Care in its lawsuit against Blue Cross Blue Shield of Rhode Island; Rhode Island’s largest health insurer settled in July 2018 after losing a summary judgment motion a few months earlier. Steward had sued BCBS in 2013 for allegedly blocking the health centre from buying Landmark Medical Center. The consultancy advised 11 mergers that reached a in-depth stage of review. Before the FTC, this includes the ongoing review of Northside Hospital’s proposed acquisition of Gwinnett Hospital System and CRH/Oldcastle’s approved purchase of Ash Grove Cement following divestiture of some North American assets. Before the US Department of Justice, it helped steer CRH/Oldcastle in their purchase of Suwannee American Cement plants, and Pounding Mill Quarry, a deal that required the divestiture of a quarry in Virginia. Ankura economists advise parties in 16 separate government investigations. This includes probes of shipping company NYK Line by enforcers in the US, Europe and Australia regarding allegations of a global cartel; of NHK Spring against a collusion investigation brought by the European Commission certain wireless carriers; and of certain banks’ alleged LIBOR manipulation by the attorneys general for New York and other US states.